Ever since I encountered Stone's 15th Anniversary Escondidian Imperial Black IPA, I have been on the lookout for awesome imperial black IPAs. I've only ever found a few, and none have met the bar which was set by Stone. However, Dubhe takes a different approach. It's not as hop forward, it's not as slap you about the face with it's roasted malts. Instead it's smooth, and opens up a bit and welcomes you in, and you have no idea it's 9.2% ABV. 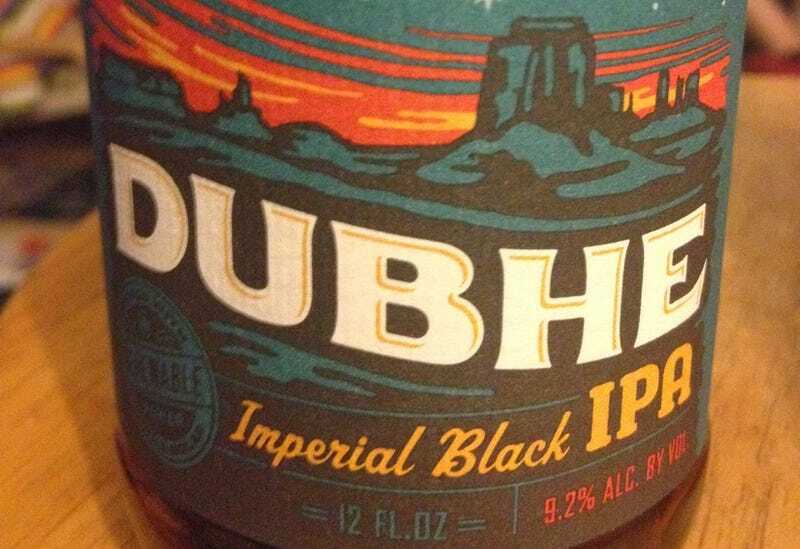 And therein lies the reason I love Dubhe (and Uinta in general). Dubhe is a great play on words, I mean, there is the obvious bit, and since it has been made with hemp seed, it has its bonafides there. But it's also named after the star in Ursa Major, and this beer can be used as a beacon, a reliably available imperial black IPA. I can speak from experience when I advise you not to age this one too long. It mellows even more, and becomes almost a porter-like IPA (not that would be a bad thing, it's just no longer the same beast). Nose: Floral hops with a bit of dark chocolate. Taste: Smooth up front with a bit of dark burnt coffee on the tip of your tongue and some pleasant bitterness to the rest of the flavor and aftertaste.